Thank you to all the amazing teams who made the 10th year anniversary of Ideas to Serve an impactful one. Congrats to all! Good luck to you and keep asking the right questions! More photos and details coming soon. Ideas 2 Serve focuses on an in-depth understanding of a social/environmental issue a student is passionate about, supporting an in-depth discovery of that particular problem. Check out this Prezi for a high-level overview of the new Ideas to Serve. We are excited to announce a new philosophy for our competition – one that focuses on an in-depth understanding of the social/environmental issue a student is passionate about. The model we now strive to implement provides a comprehensive approach to social innovation. This approach encourages students to: identify and build on the assets of the communities they want to serve; research the solution landscape to learn from both what works, and what failed (and why); take a systems approach to identifying the root cause versus the symptoms of the issue; conduct customer discovery to better understand the needs of the community; and to carefully consider the possible unintended consequences of any solution they might propose. In short: we are moving away from pushing for solutions to social issues and instead we are supporting (and incentivizing) an in-depth discovery of any particular social/environmental issue a student is passionate about. Students who are interested in understanding complex problems and/or involved in community - based grassroots efforts to address such problems but don't have an "innovation" can now be part of I2S - strengthening the "serve" component of it. March 15 – Intent to Compete Deadline* - Extended to March 25! *Teams that submit by March 22 will receive one free entry (a $50 value) to the Starting a Social Enterprise boot camp at the Center for Civic Innovation on March 30. We are morphing our previous tracks - Ideas and Advanced - into two new tracks: Problem Discovery Track - for students who are exploring a social/environmental issue with the intent of gaining a deep understanding of that space and where their skills fit in, and Solutions Discovery Track - for students who are more advanced on their discovery journey and are formulating community-based solutions. The competition is open to any current Georgia Tech student (undergraduate and graduate) and recent alumni. Applications are now closed. Thank you to all who competed! Ideas to Serve judges are social sector experts. Some are social entrepreneurs, some are leaders of local nonprofits, some are impact investors, and some are academics who specialize in these areas. A list of this year’s judges will be shared with all participants before the Finals. Beyond evaluating the entries, judges are also ready to connect you to their network and to provide valuable feedback for every team. We encourage all finalists to take advantage of this opportunity, listen to the feedback, and follow-up with judges that indicated their willingness to make connections for you – these are the most valuable outcomes of participating in I2S. 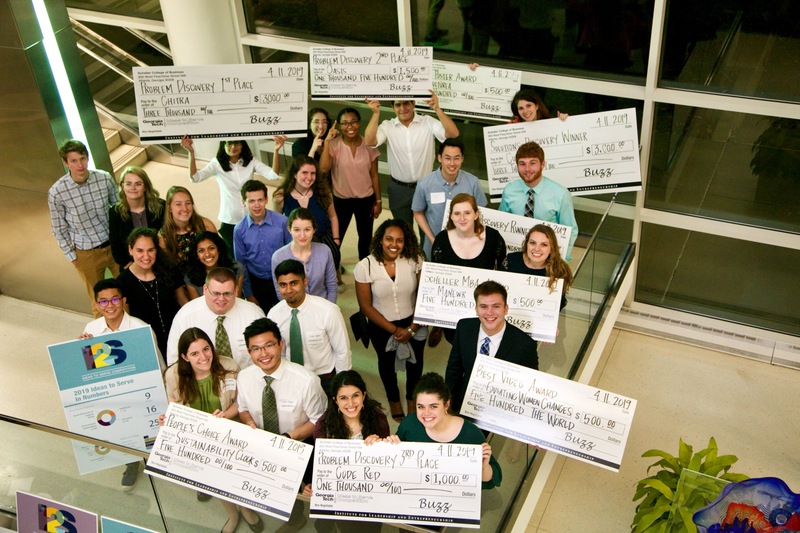 Over $12,000 in prizes were awarded in the 2019 competition! Even if you were not selected to be a finalist, you could be eligible to compete for any of the specialty prizes. These changes to the format were developed in close partnership with Serve-Learn-Sustain, as we have worked with them over the past 1.5 years to create and launch the new SLS Innovating for Social Impact Program. The changes in approach were inspired by feedback from our expert collaborators – judges and mentors, who are practitioners in the social impact space, and who have worked with I2S teams for many years. Participation in the Ideas to Serve Competition fulfills the Final Deliverable requirement for the SLS Innovating for Social Impact Program. Have questions? Reach out to .